Each day for over two years, Colorado resident John Woods gets a visit from his local moose, which he has dubbed "Momma Moose." The animal typically plays with a tire swing in his yard, but recently, she found something more entertaining. Woods caught the lonely moose cozying up next to a metal moose statue he keeps in his yard, possibly looking for a bit of romance. What is a moose family? Moose are solitary and do not live in families or herds. The calves follow the cow during one year. During the rut the bulls may come together to battle for mating supremacy. After mating, the two sexes go their separate ways. Though they may occasionally feed in the same grounds, they tend to ignore each other. How large is a moose? Moose is the largest of all the deer species. They reach 170 – 210 cm height at shoulder. Bulls weigh weigh 380 – 850 kg and cows weigh 200 – 360 kg. Adult moose can run as fast as 35 miles per hour. They are excellent swimmers and can cross large expanses swimming up to 6 miles per hour for two hours at one time. The word "moose" is derived from the native North American Algonquian Indian word meaning "twig eater"
Responses to "Looking for love? 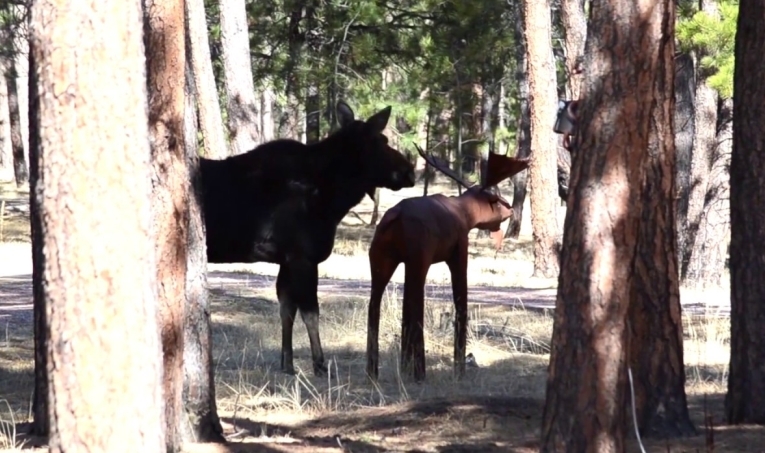 : Female moose cuddles up next to statue of a moose"